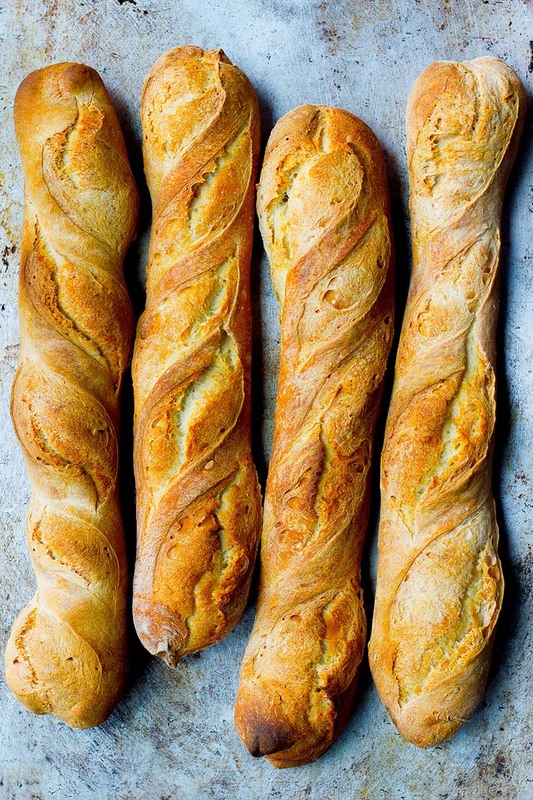 This classic french baguette recipe breaks down the step-by-step process so that you can achieve artisan homemade baguettes! This recipe produces authentic french baguettes with a crusty outside and a fluffy and chewy inside. Prep the Oven & Other Equipment: During the final resting period, prep your pans and your oven. Position one oven rack in the very bottom position in the oven and another rack in the middle position. Place a cast iron skillet or another heatproof skillet on the bottom rack and a baking stone, baking steal, or a sheet pan turned upside down on the middle rack. Preheat your oven to 500°F (260°C). You want your oven and pans to be heating for at least an hour before the bread goes into the oven. You will also need to set up a lightly floured lint free towel or baker's couche to let your shaped dough rise on. Additionally, prepare a pizza peel or an unrimmed baking sheet with a piece of parchment paper. Shape into Baguettes: With the seam side up, press the first piece of dough into a thin rectangle. Starting at the top left edge, begin folding down the dough about ½-in (1½ cm) and sealing it with your fingertips, working your way across the top. Repeat this process, continuing to fold down on the dough and sealing to create a tight log. Once you have a thin, tight log, turn it seam side down. Using both hands, roll the dough on the counter-top, working it into a long thin snake shape. Try to keep the dough as even as possible and work it into about a 14-in (36 cm) baguette. Move the piece of dough to your prepared towel or baker's couche. Push the towel or couche up on both sides of the baguette to create folds to hold the dough's shape. Repeat this process with the second piece of dough. Transfer the Dough & Score: Place a baguette board or a small cutting board right beside one of the baguettes. Gently pull up on the towel to flip the baguette over onto the board. Gently flip the baguette onto the parchment lined pizza peel or unrimmed baking sheet, so that the seam side is down. Repeat this to move the second baguette over. Using a very sharp knife or a bread lame, score the top ofthe baguettes 4-5 times. The cuts should go diagonally and at a slight angle, going about ¼-in (1/2 cm) deep. Bake: Fill a small bowl with about 2 cups of ice cubes. You want to work quickly and carefully when transferring the baguettes. Open the oven and gently slide the whole piece of parchment paper with the baguettes onto the preheated baking stone or sheet pan. Quickly pour the ice cubes into the preheated skillet and immediately shut the oven door. Turn the oven temperature down to 475°F (246°C). Bake for about 40 minutes or until the baguettes are a deep golden brown and sound hollow when tapped. Recipe created by Baker Bettie. What is the max time recommended for the pololish to be out before using? The preferred time for the poolish to sit is 8 to 10 hours. I wouldn’t recommend going over 12 hours. Let us know if you make it! I’ve used this recipe dozens of times. It’s proven to be a really good starting point. Based on my experience with it, I would make two suggestions. 1. I use AP flour. I get a better final result if I lower the reccomended hydration to about 125g. 2. I bake at 475 degrees for 25 minutes with a pan of water on the lower shelf for steam.